The recent launch of Under Armour’s latest Hovr Connected running shoes – with an embedded sensor to track and coach runners – wasn’t just your regular product upgrade. Putting chips into its entire flagship running shoe range was a signal of intent from a company with very big wearable ambitions. The goal: to create a ‘head-to-toe experience’ to revolutionise athlete tracking for anyone with a goal to hit, from park runners to the Olympic podium. If it sounds ambitious that’s because it is, particularly when you consider the track record of wearables in this sector. Other notable brands have dipped their Three Stripe or Swooshed toes into the wearable tech waters and ultimately recoiled, muttering something about it being too cold. The most notable attempts include the Nike+ Training and Adidas MiCoach systems, which put sensors in our shoes, but these failed to catch on. Some of Under Armour’s own attempts to innovate in the space in recent years didn’t exactly set the world on fire either. The HealthBox holy trinity of connected scales, fitness tracker and heart rate monitor were discontinued in 2017 after failing to impress, and its heart rate tracking headphones in partnership with JBL received mainly middling reviews. Only the Nike Fuelband stands out as a relative success story, but even that had a short life span. The truth is, while technology has ripped through countless other industries from travel to takeaways, it hasn’t disrupted the big sports brands in the same way, at least not in the hardware-software sense. Today, aside from small brand partnerships between the likes of Sensoria and Vivobarefoot, no one apart from Under Armour is gambling on chips in shoes. Even Under Armour’s steps have been tentative up until now. It launched its first connected shoe in 2015 and only rolled the range out to the North American and Chinese markets. But that’s about to change. Under Armour already makes around half a billion dollars from its running footwear business, and group general manager for Run, Train & Outdoor, Topher Gaylord, believes his team’s connected running shoes can help the company carve out a bigger slice of a booming running market. “We know that running right now is one of the fastest growing and largest participation sports in the world today,” says Gaylord. “And the high performance and performance footwear market represents a large market opportunity. “But to really capture the opportunity you have to create meaningful, differentiated compelling product and that’s what I think we now have,” he adds, pointing out that Hovr connected shoes will cost the same as your regular running kicks. There’s no surcharge on the additional smarts. In his eyes that’s a compelling proposition that gives Under Armour’s shoes the edge. “You have a chip in the shoe which gives every consumer access to much higher fidelity or a much more precision measurement without the cost of an expensive watch,” says Gaylord. Whether the running-shoe-plus-app combination is a realistic replacement for a running watch is debatable, but there’s some firm logic in the connected shoe concept, particularly if you can get the shoes to sync with your favourite running watches and apps – and crucially deliver data those devices can’t capture or track as accurately such as power, ground contact time, balance and other biomechanical metrics that are best measured from the foot. 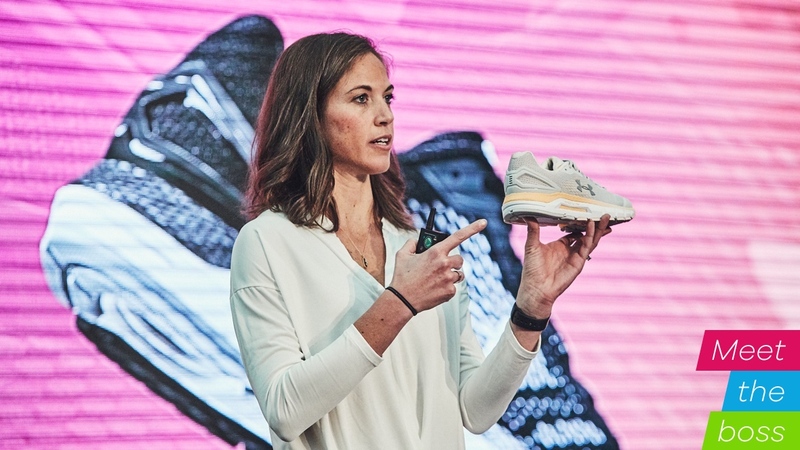 Upgrading the shoe with new features as the technology develops is already possible, says Gaylord, with software updates that enhance the chip over the air. But this connected world isn’t just about making our shoes incrementally smarter. It’s about big data too. With 245 million users on Under Armour’s MapMyRun and many more on MyFitnessPal and Endomondo, the insights and commercial opportunities that come from products that sync to those platforms are huge. What was once a relationship that ended once you’d bought a pair of shoes will become an ongoing two-way conversation that could revolutionise how Under Armour understands and caters for runners’ needs. “Over time I think there's kind of other uses of population level data that are going to become really interesting,” says Ben McAllister, director of connected fitness at Under Armour. “For example, we've seen that there's a correlation between the inseam of the shorts an athlete purchases and how fast they are as a runner,” he adds. By which he means Under Armour can pair shopping data with insights from MapMyRun to confirm something we’ve all suspected all along; that runners who buy short shorts tend to be faster runners. In practical terms insights like these could be harnessed to create more streamlined online shopping experiences, says McAllister. “We don't do this today but how much better would it be if you could just acknowledge that I'm a runner and direct me quickly to the running shorts that runners tend to buy most frequently? We sell a lot of different types of shorts and that's a kind of way to make that experience better,” he says. Dave Dombrow, chief design officer at Under Armour, predicts that in the near future this data will enable what he calls “a time of recommendation”. “When you get asked that question "What shoe should I run in?" sometimes there's not really a great answer. But in the future it will be very easy,” he says. “The data will all be there and we can correlate it back to our footwear and say, ‘Based off your data you should be running in the Infinite or the Velocity.’ And that's actually already real, we can start to go down that path very shortly,” he adds. When you think of connected shoes in those terms, it seems less like a gimmick and more like a smart long play by Under Armour. If they can get enough shoes on enough runners it has the potential to create a virtuous circle where consumer behaviour drives product development but based on real data. It seems more inevitable that all running shoes will one day come with embedded sensors. And the company’s vision goes way beyond what we lace up too. Under Armour has invested heavily in state-of-the-art athlete performance centres in Portland and Baltimore to enable its teams to work with some of the world’s biggest names, such as heavyweight boxer Anthony Joshua. The company sees potential for wearable innovations that go beyond chips in shoes to address underserved aspects of an athlete’s – and by proxy our – lives. That includes recovery, sleep, nutrition and even travel. “Most other athletic brands focus very much on that singular moment of performance,” says Gaylord. “Through data we know that an athlete isn't great at the moment of performance because they're great at that one moment. They're great because of all the other things leading up to and after that moment. Essential reading: Which Garmin is right for you? “And so, we've opened up the lens wider and really studied closely those moments after performance and how we can improve athletes there,” he adds. Under Armour fundamentally believes that technology can transform athlete performance, says Gaylord, but that wearable tech is still a new frontier. “The way we're integrating today with technology is still so rudimentary compared to what we will be doing, even though it feels like so much more than it was 10 years ago,” say Gaylord. Dave Dombrow, chief design officer at Under Armour, points to this combination of skills and knowledge under one roof as key to solving the challenges around creating the proprietary chips in its connected shoes. He also suggests this is one reason Under Armour doesn’t have a lot of competition in this space. Gaylord adds: “We have teams in Austin and San Francisco solely focused on digital technology and how it can integrate. And then we've got teams here in Portland and Baltimore constantly trying to make the ultimate product.